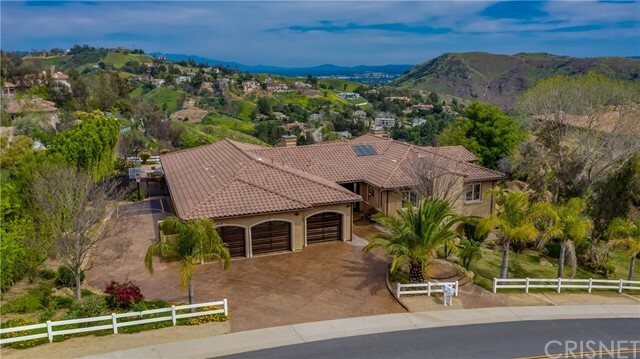 All Bell Canyon homes currently listed for sale in Bell Canyon as of 04/24/2019 are shown below. You can change the search criteria at any time by pressing the 'Change Search' button below. "New construction, this exquisite Mediterranean/Tuscan-style home with a European flair, sits perched on a hill for ultimate privacy. 360 degree views. 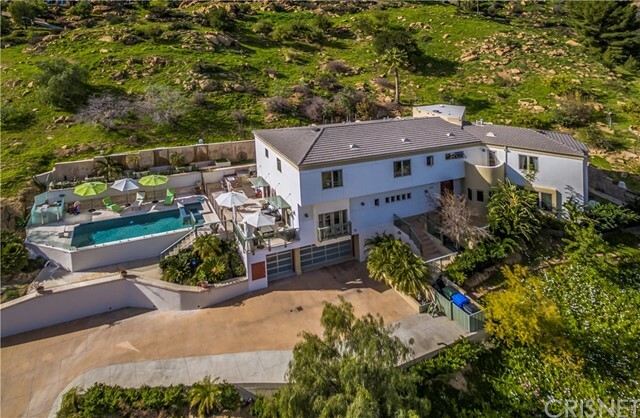 Situated behind double gates, this Bell Canyon home is an entertainer's paradise.With 5 bedrooms 4-en suite bathrooms and one with stall shower. Hardwood floors surround the sophisticated kitchen with Wolf and subzero appliances,quartz counters and farm sink united in perfect harmony. Food and butler's pantry. Media room for private viewing and is pre-wired. Custom built with every detail in mind,the entry features an 10ft custom door,custom windows,air conditioning throughout and a formal entry with curved staircase and featuring second staircase with side entrance. Recessed LED lighting thoughout. Three reflective glass fireplaces indoors.There is a 5 car garage,beautifully landcaped grounds and amazing pool with baja shelf,automated Jandy pool system and oversized Jacuzzi. The outside features stunning granite counters on a full-service barbecue; including refrigerator,sink and storage. Limestone conversation fire pit adjacent to the pool. Also,With four patios spanning 880 sqft. The association grounds include equestrian facilities trails,community center.So much detail and perfection-a MUST SEE!!" "Presenting this newly built custom Tuscany Villa style estate in the prestigious guard-gated equestrian community of Bell Canyon. Captivating custom stone work around the entry outlines the iron and glass double entry door. Open floor plan with large windows brings light into the living and dining room with large porcelain tile flooring. Entertain stylishly at the wine bar and chef's dream kitchen, large center island with seating, granite counter tops, custom built cabinets, Subzero Wolf kitchen appliances, and pantry. Guest room with full bath and huge master suite on the main floor with fire place, soak-in tub, dream walk-in closet with a magnificent krystal chandelier. Upstairs offers an office and three large bedrooms with en-suite full baths, walk-in closets, balconies, and wood floors. Folding back the family room's glass corner doors virtually adds 900SF to the first floor opening up to the huge lanai and bbq area. The resort-style backyard, with almost 1200 SF of entertainment space, offers a custom bbq island, custom built infinity pool, fire pit, beautiful grounds fully landscaped with irrigation system. 3 car garage and spacious utility room with ample storage. Community has miles of trails, gym, park, and equestrian center. A must see!" "Custom built estate in elite, exclusive & private community of Bell Canyon. Architectural masterpiece, luxuriously designed. 320 degree panoramic sunrise/sunset/city lights & valley views. Family room w/beamed ceilings, captivating views, floor-to-ceiling raised hearth stone fireplace & hardwood floors. Gourmet kitchen w/rich wood cabinetry, self-closing doors, granite counters, farmhouse sink, Viking appliances: built-in refrigerator & freezer, 6-burner gas cook-top, double ovens, warming drawer, 2 dishwashers, center island w/vegetable sink, walk-in & butlers pantry & breakfast bar. Breakfast nook w/panoramic views, trey ceiling & travertine floors. Formal dining room w/west facing window capturing dynamic sunsets & built-in buffet. Wine cellar/room. Master suite w/host of windows, mesmerizing views, retreat, fireplace, built-in bookshelves, hardwood floors, walk-in closet w/built-in dressers/organizers. En suite master bath w/myriad of windows, panoramic views, granite topped vanity, dual basins, jetted soaking tub, travertine tiled walk-in steam shower w/multiple shower heads & bench seat, heated towel racks & travertine floors. Game/great room w/wet bar, French doors leading to balcony w/views. Study w/coffered ceiling, plantation shutters, built-in bookshelves, credenza w/desk & fireplace. Gift wrapping room. Backyard w/exhilarating panoramic views, putting green, outdoor kitchen, covered patio, infinity pool/spa. (Download the itemize upgrade list from Supplements)"
"Bell Canyon at its best! Soon as you enter the gate, enjoy the views before you get to this custom estate designed for better living. The open concept, high ceilings, along with views of the canyons give you a spacious living. The home offers six bedrooms and six bathrooms. French doors throughout the first-floor wrap around the deck, seamlessly connecting you to the indoor and outdoor spaces together. From the deck, you'll have views of the professional rare North/South tennis court, solar panels, horse ring/facilities, certified pad for a guest house, private trails, 5.71 acres of land, and opportunities. Tucked away on a cul-de-sac, you have no neighbors behind you for even more privacy. A rare Bell Canyon gem that offers you high-quality modern day technology that's energy efficient, eco-friendly, and cost-effective. Thanks to the solar panels(100% paid), air filters (Green Living), 100-gallon water heater, generator (environmentally friendly), tinted windows (Light and UV rays), cooling technology (Wine Cellar), stainless steel appliances, solar heated salt water pool & spa (App Friendly). Within the Bell Canyon community, the amenities include baseball fields, trails, equestrian center, parks, swimming pool, fitness center, and community events. Who said you can't have Quality and Quantity?" "Stunning architecture, double grand staircase & foyer - suitable for grand events. 5 Bedrooms, 5.5 Baths, Game Room, Billiards Room, Sun Room, Bar, Office. Mediterranean in style, commanding in design & scope. Imposing living room with high ceilings, crown moldings, huge windows overlooking the view. Immense dining room can accommodate a significant formal dinner party. The massive kitchen is one-of-a-kind & features Viking appliances, 2 refrigerators, 2 ovens, microwave, 2 sinks, wine refrigerator, walk-in pantry, Bosch dishwasher, stunning wood, pentagonal breakfast room with view, & enormous center island. Massive solar system - no electric bills. Rooms boast high ceilings, recessed lighting and most have stone floors. Replete with pool table, the billiards room makes a great retreat with dark carved wood - the perfect man-cave. Sun room is circular with views of the sunset. Circular game room upstairs. Voluminous master suite which enjoys view & privacy, his & hers closets, jetted tub. All baths feature stone floors & counters. 3 beautiful fireplaces in living room, master bedroom & billiards room. Sited at the end of a quiet cul-de-sac, gated & grand, this architecturally distinctive home could be the scene of elegant affairs or buyer's choice. Bell Canyon is home to a fitness center, tennis courts, equestrian center, 2 private parks, trails, manned guard-gate, & is served by the Las Virgenes Unified School District. Living well is the best revenge." "Quality and heart, with no exceptions, is what is brought to life in this 5,700 sq ft Tudor estate bolstering 6 bedrooms and 5 1/2 baths. The property s large 1.3 acres provides privacy for this on top of the world estate. 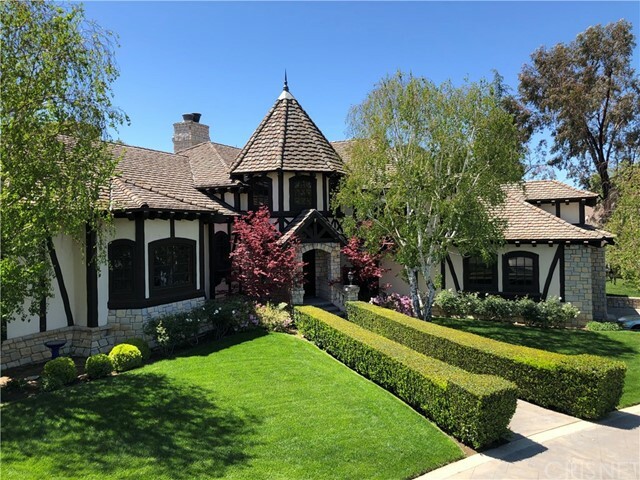 As you drive through the electric gates one is struck by grand curb appeal of this stately English Tudor finished in hand-chiseled Santa Rita Stone. A custom solid oak door opens into the octagon open-beamed turret. Within this open planned design, the grand living room features a two-story beveled glass window which frames the picturesque courtyard outside. One of the many focal points in this home is the masonry fireplace finished with Santa Rita Stone featuring an Enkeboll designed Oak mantel. The cathedral pine ceiling is enhanced by 6 x12 oak beams. Distressed oak hardwood floors run through the kitchen, formal dining room & family room. The gourmet kitchen has granite counters, a Sub-O refrigerator & 6 burner Wolf range. The kitchen is also adorned with a breakfast bar and breakfast nook featuring a 6 window open beamed turret. The spacious formal dining room has a coffered oak ceiling and bay windows. The master suite becomes a sanctuary with its masonry fireplace finished in marble, pine ceilings, and a walk-in closet. The ensuite bathroom features a spa tub surrounded by a 5 window open beamed turret. Well-manicured grounds surround this home with a gray bottom pool and spa, waterfall, enormous grassy yard, privacy, and phenomenal views." "The Perfect Celebrity Get Away!! Separate Guest house/recording studio. California living at its finest with this Santa Barbara inspired custom villa in the prestigious guard gated Bell Canyon. Built in 2007 and situated on over an acres of land, this incredible property boasts beautifully landscaped grounds, privacy and breathtaking views. The stunning entry features only a hint of the architectural elements you will find throughout this exceptional home. Mosaic inlaid flooring, cornice accents, oversized solid doors, crown moldings, gorgeous travertine and distressed wood flooring. The main level includes the living room, formal dinning room, spacious family room, a separate wine cellar, one bedroom and laundry room. Gourmet kitchen with incredible center island, stainless steel sinks, Thermador 6 burner stove, Sub-Zero refrigerator, two Bosch dishwashers, two Wolf ovens and food warmer, Espresso machine, wine chiller and walk-in pantry. Upstairs you will find four spacious bedrooms which include two master suites with lots of character and charm. The main master suite features a luxurious bathroom, rain and steam shower, dry sauna, jacuzzi and two spacious walk-in closets plus a private balcony. Lushly landscaped backyard w/oversized pebble reck pool & separate guest house with full bathroom and walk-in closet, great for entertainment." "A true estate set on sprawling 2 acre grounds, this residence has it all. From the moment you enter the two story rotunda entry you are struck by the amazing sense of space. The perfect place to entertain, the open and flowing floor plan offers soaring ceilings and walls of glass that soak in the serene mountain and city light views. The expansive public rooms are trimmed in warm, inlayed Travertine flooring. The center island kitchen is a cook s dream with state of the art stainless appliances, Granite counters and rich cherry wood cabinetry. A huge deck looks onto the impressive grounds and is the perfect spot for alfresco dining. Downstairs you will find the bedroom suites all generous in size. The master wing is complete with a Marble master bath, huge walk in closet and is all warmed by a romantic fireplace. Outside you will find a private covered terrace looking onto the inviting pool and spa area and the huge outdoor kitchen area. A stairway leads from there to the lit Championship tennis court where you can play a match with the backdrop of the incredible canyon views. There is also a private paved road that leads to a graded flat pad perfect for horses. 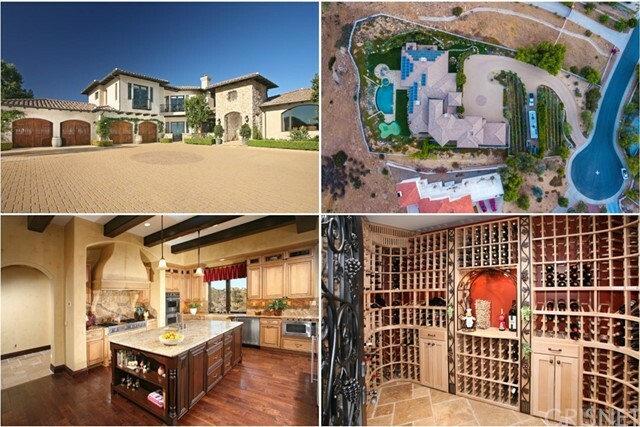 A truly one of a kind estate that offers it all." 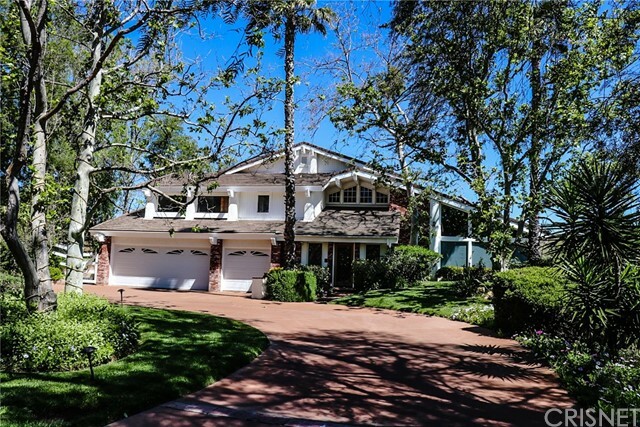 "This phenomenal 5 bedroom, 5 bath home sits on a beautiful view lot in guard gated Bell Canyon! This open concept floor plan is just what buyers today are looking for. The custom wood front door opens to a formal entry and living room with a two sided fireplace and vaulted ceilings! The kitchen has a center island, chiseled stone counters with a glass tiled back splash, stainless steel appliances including a 6 burner Wolf range, double oven, large pantry, room for a wine cellar and breakfast bar. The kitchen flows into the great room with vaulted beamed ceilings, dining area and built-in entertainment center. The luxurious master suite is on the main level and has a marble bathroom with a spa tub, double sinks, enormous closet with built-ins and access to a covered patio. Double doors allow access to a fantastic office with built-ins. Jack & Jill large bedrooms share a gorgeous bathroom with double sinks! There are two additional bedrooms, bathrooms and sauna downstairs as well as an enormous bonus with doors opening to a grassy play yard. Many architectural details throughout including coffered ceilings, wainscoting and neices. French doors throughout open to spectacular city and bolder views and amazing grounds with an infinity pool, built in BBQ, covered patio and more! The stamped concrete driveway has possible room for an RV and built-in basket-ball hoop." "This custom Bell Canyon home sits on a mostly flat approx. 1 acre lot! Gorgeous curb appeal with Cobblestones, brick and a massive wood door with stained glass. The living room has a cobblestone & brick fireplace, wood floors & crown molding! The kitchen has a double stainless steel commercial range with a griddle, granite counters, wood cabinets & farm sink. The breakfast room has a turret ceiling & many windows that bring the outside in! The kitchen opens to the family room with wood a beamed ceilings & fireplace AND the 2nd level loft with wood floors and a balcony where one can enjoy Valley & BC Views! The spacious master suite has vaulted beamed ceilings, window seat, fireplace & huge walk-in closet. Jack & Jill bedrooms share a bathroom finished with tumbled marble, double sinks and steam shower! The 4th bedroom is ensuite! One bedroom down with an adjacent bathroom finished with Walker Zanger tile & a clawfoot tub! Quality finishes throughout include Imported German Windows, Woodwork & Slate roof! Entertaining your family and friends is easy with a beach entry waterfall pool, spa, built in BBQ and large grassy yard! There is a rose garden and orchard as well as room for horses. Plenty of room to park with a 4 car garage and large driveway with room for many cars & possible RV parking! Las Virgenes Schools! Bell Cyn is a Guard Gated Community with an equestrian center, trails, playground, tennis courts, fitness center & many events throughout the year!" 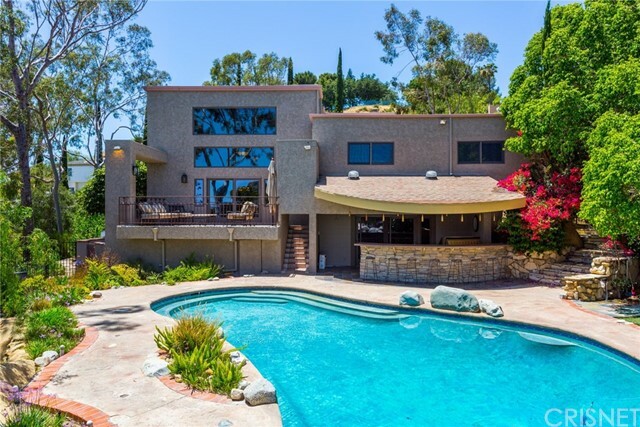 "One of a kind incredible guard gated Bell Canyon Modern Contemporary resort estate with views. 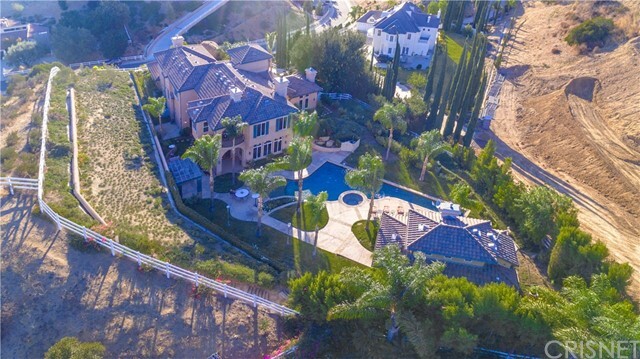 This estate has it all with panoramic and city lights view, privately nestled in the tranquil equestrian community of Bell Canyon boasting 5 bedrooms, 7 bathrooms, office, views from almost every room, bamboo hard wood floors, bonus room which could be a great sound studio or man/lady cave/office, spa room, waterfalls, sparkling designer glass tile pool and spa, sports court, custom pizza oven, CAT 6, Lifesource water system and fruit orchards on over an acre. Built on bedrock, this exquisite green design was developed by a renowned architect to be fire/termite resistant with metal stud walls, engineered truss system floor construction and eco flooring. The open floor plan offers an entertainers dream with its large scale living spaces and clean lines. The gourmet kitchen with center island, 4 refrigerators, commercial grade stainless appliances, maple cabinets is perfect for many cooks in the kitchen. The kitchen and eating areas open to the family room overlooking the pool area with waterfalls, outdoor kitchen bbq and pizza oven. All bedrooms on the 2nd floor are bedroom suites. The master retreat is private and overlooks the grounds, mountains and orchards. There is a separate sauna retreat to unwind and a large sports court for playtime. The estate has video surveillance cameras and a security system for added security. Perfect Entertainers estate and priced to sell!" "Nestled at the top of a private driveway, lined with gorgeous eucalyptus trees sits this one of a kind Bell Canyon view home. Step through the large glass front entry door into this light and bright home featuring an open floor plan, updated chefs kitchen with viking appliances, large center island and adjoining breakfast nook that opens to the family room and formal living room with 2 story ceilings and large picturesque windows. Highlights include a front and back staircase which leads to the private guest quarters, a large master suite with walk in closet, private balcony, all stone bath with spa tub and separate shower. The downstairs secondary living room opens to an entertainers dream yard complete with a covered BBQ center, tranquil walking paths, patio dining area, outdoor shower and sparkling pool & spa overlooking the beautiful Bell Canyon valley. Come see this spectacular home before its gone!" 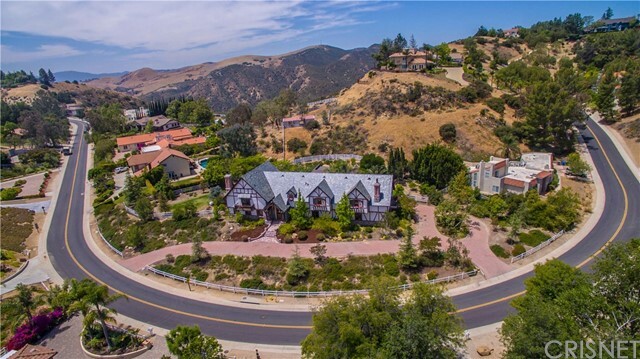 "A long, private tree-lined drive leads you to this Classic California Spanish Estate located in the prestigious guard-gated community of Bell Canyon. Situated on 1.12 acres, this home provides a sprawling setting with serene views from almost every room. 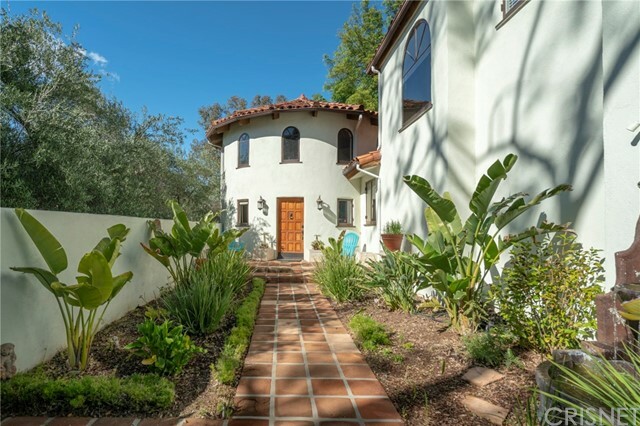 The timeless courtyard design offers an inviting approach to the soaring rotunda entry. Inside you are immediately struck by the wide open floor plan with vaulted beamed ceilings, creating an amazing sense of volume and space. The home has undergone numerous updates throughout, seamlessly blending modern design elements with timeless finishes. The generous yet welcoming great room opens into the kitchen and outdoor spaces, creating the perfect flow for both formal and casual entertaining. The gourmet kitchen has been updated with granite counters, a walk-in pantry and a hand-hammered copper sink. Upstairs you will find the intimate Master suite offer soaring ceilings, private terraces and a spa-like master bathroom. The secondary bedrooms are all situated in their own private wing. There is a recently renovated one bedroom apartment with its own private entry. Outside you will find a romantic arched patio right off the great room, perfect for your morning coffee or dining al fresco with friends. The generous grass area is shaded by mature shade trees set against the dramatic vistas. With 1.12 acres there is so much space for any other outdoor amenities you may want to add or to simply enjoy the serene grounds as they are." "Views abound from nearly every window of this light-filled home in the guard gated community of Bell Canyon. A serene front garden greets you as you approach the front entry where once inside you will find a two-story foyer leading you into the open living space. The living room, dining area, and gourmet kitchen flow seamlessly together creating the perfect space for entertaining. Glass doors open to the large and newly renovated patio with amazing views of the surrounding mountains and Bell Creek. The main level of the home is complete with a Den/Media Room and an office. Upstairs you will find 4 bedrooms including the spacious master suite with cathedral wood ceilings, 2 walk-in closets, private balcony, and bathroom with dual vanity. 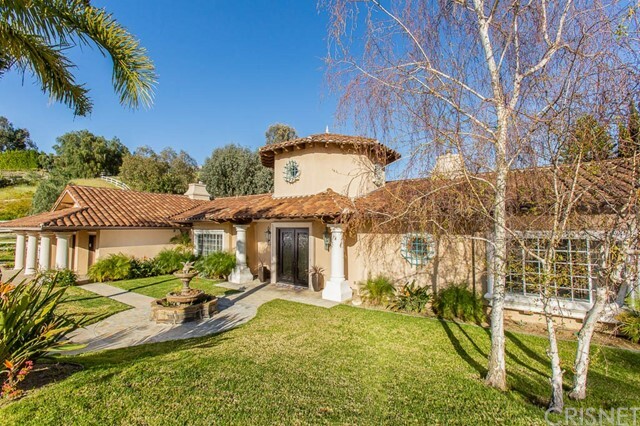 This property is in the award-winning Las Virgenes School District and is wonderfully situated on one of Bell Canyon's flattest cul-de-sac streets enjoying easy access to the Equestrian Center, Fitness Center, Tennis Courts, and more." "Killer deal! Killer views! Room 4 horses, possible sport court, RV parking, pool! 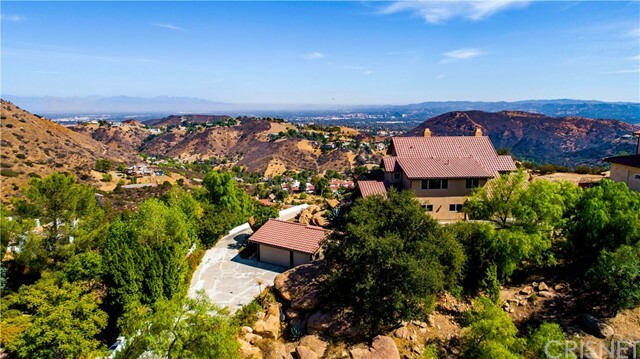 Huge $100,000.00 reduction for one of the most unbelievable view properties in Guard Gated Bell Canyon! The enormous front porch is perched above a picturesque setting of natural boulders, overlooks an orchard and incredible views. The double door entry opens to the living room with two-story wood beamed ceilings, a fireplace and travertine floors. All bathrooms have been remodeled with travertine, tumbled marble, fixtures and custom cabinets. The kitchen has granite counters, stone backsplash, stainless steel appliances, a center island and eat-in area. The spacious master suite has an enormous closet and luxurious master bathroom with a spa tub, travertine floors, granite counters and double sinks. The family room has high ceilings and hardwood floors. Freshly painted throughout with newer carpet! The cozy den has a tumbled marble fireplace and walls of glass that open to a travertine balcony with a spa and breathtaking toward the San Fernando Valley and mountains beyond. Wonderful orchard in front yard! Situated on a quiet cul-de-sac! Bell Canyon is a guard gated community with an equestrian center, Tennis courts, a fitness center and trails. Community events include Snow Day, Halloween Party, Easter Egg Hunt and more. Also a part of the highly acclaimed Las Virgenes School District which includes a bus service."